These muffins came about with a good friend of mine, who recently became a mother. Well, maybe not recently, seeing as how her daughter is a year and a half now. We got together to bake baby’s first cake, a blueberry yogurt cake, which ended up denser with a bread-like texture. It also took longer to bake than anticipated because of the density and while the yogurt made the cake very moist, it was still a bit too wet in the center after the sides had finished baking. But we had a great time showing the little one how to measure and helping her develop motor-skills, along with introducing the concept of patience: she had to wait for the cake to finish baking in order to reap the reward of eating it. And of course, later on I asked myself, how could I improve on the recipe? Experiment and re-bake, naturally! After some ingredient ratio adjustments and a few other poor attempts at baking, I realized that “cake” was a misnomer- it actually wanted to be made as muffins. The smaller size allows the batter to cook evenly and quicker, which makes for successful baking each time. And in the case of mommy and baby, more time bonding instead of lamenting over failed cakes. 1. Preheat oven to 375F. Grease a muffin pan (Or line with paper cups). 2. In a large bowl, sift together the flour, baking powder, and salt. 3. In another large bowl, whisk together the yogurt, eggs, sugar, vanilla, and vegetable oil. Stir in the blueberries. Stir in the dry ingredients, one-third at a time, until just combined. 4. 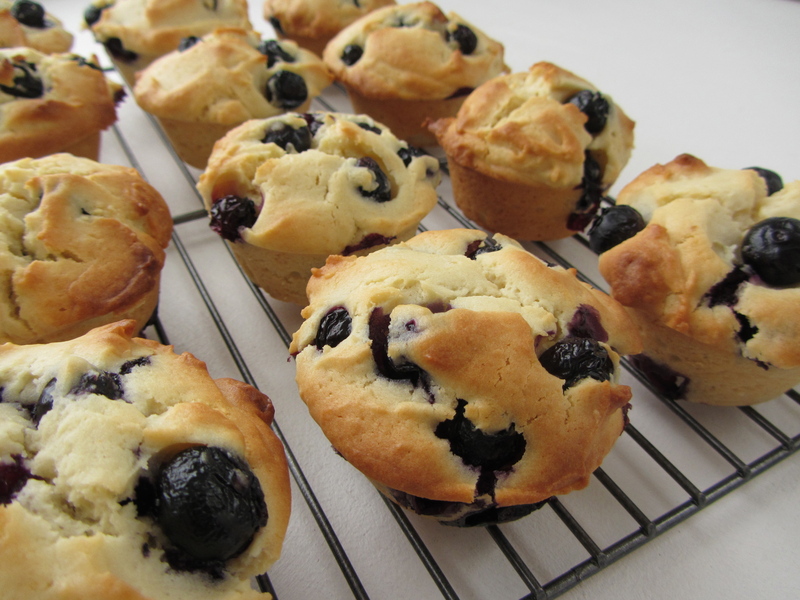 Divide batter into the prepared muffin pan, filling each cup close to the top. Bake at 375F until the tops are golden brown and a toothpick inserted into the center comes out clean (about 30-35 minutes). 5. Serve with a drizzle of honey if desired. * This cake is great to make with kids. The ingredients are simple, and it is easy to put together. It is also lower in sugar versus other baked treats, the addition of berries and yogurt provide natural sweetness and moisture.